France has issued some beautiful engraved stamps showing French landscapes, historic buildings and so on. I thought it might be nice to go on a stampy Tour de France. Where better to start than in Paris itself? Here is the city coat of arms on a 1965 stamp, SG 1499f. The boat under the fleurs de lys (stylised lilies) is the symbol of the medieval guild of Paris water merchants, to whose activities the City motto refers - "Fluctuat nec mergitur", Latin for "She is tossed by the waves but does not sink." 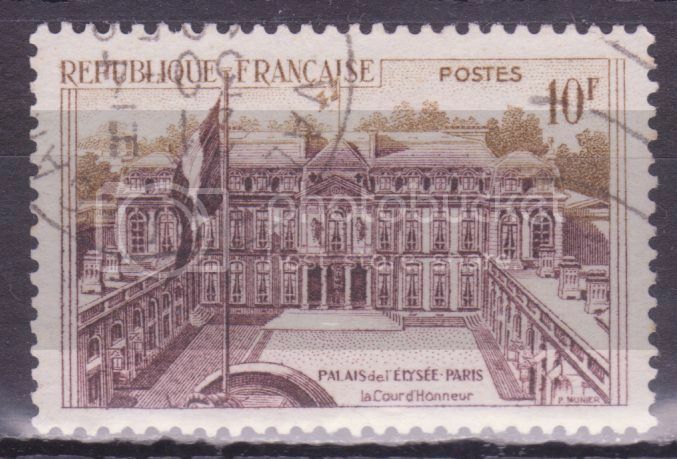 ... and where better in Paris to start than the Élysée Palace, the official residence of French Presidents since 1848, shown on a 1957 stamp, SG 1351? It is near the Champs-Élysées, named after the Elysian fields, where in Greek mythology the more blessed dead dwelt. It was closed during the German occupation of Paris in WW2, being reoccupied by the then President in 1946. The Eiffel Tower needs no introduction. On these 1951 stamps (SG 1132-1133) it is shown sandwiched between the two wings of the Palais de Chaillot, where some of the early meetings of the United Nations took place. At the Western end of the Champs-Élysées in Paris stands the Arc de Triomphe, started under Napoleon in 1806 but not completed until the 1830s. It commemorates French soldiers who died in the French Revolutionary and Napoleonic Wars; under it is the Tomb of the Unknown Soldier from World War 1. It has been the scene of victory parades - including that of the Germans in Paris in 1940. 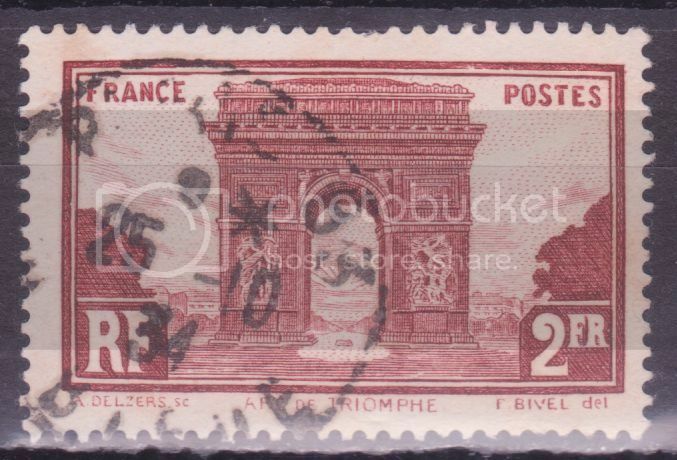 It is shown on a French stamp of 1931, SG 471. 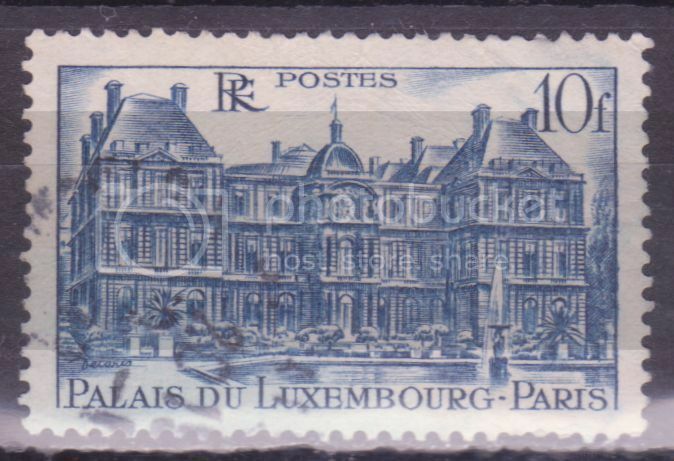 Our next stop in Paris is at the Palais du Luxembourg, on the left bank, shown on a 1946 French stamp, SG 978. Dating back to the first half of the 17th century, it was built for Marie de Medici when she was regent for King Louis XIII. In 1715 it became the residence of Marie Louise Elisabeth d'Orleans, Duchess of Berry (1695-1719), notorious for her promiscuous love life and capacity for food and drink. In the mid-18th century it was for some 25 years a museum. During the French Revolution it became a prison, before becoming Napoleon's first official residence. In World War 2 it was the French HQ of the Luftwaffe, with some of the luxurious rooms used by Göring on his visits to Paris. In 1946 the Paris Peace Conference took place there - this was the conference which settled terms with Italy, Romania, Hungary, Bulgaria, and Finland. Since 1958 it has been where the French Senate meet. An educational visit to the Lycée Louis-le-Grand in Paris, in the Latin Quarter on the left bank. This school was founded in 1563 under Louis XIV and is one of the most prestigious public secondary schools in France. The roll-call of those who have studied there reads like a list of many of France's greatest: it includes writers like Molière, Voltaire, Gautier, Victor Hugo and Baudelaire, a number of French Presidents, philosophers such as Diderot and Sartre, mathematicians such as Galois and Henri Poincaré, artists like Delacroix, Degas and Bonnard, and the 18th century St Francis de Sales. In 1963 France issued a stamp for the 400th anniversary of the founding of the school, SG 1617. In 1963 France issued a stamp (SG 1630) to mark the opening of the Maison de la Radio-Television. This round building is situated in the wealthy 16th arrondissement, on the opposite bank of the Seine to the Eiffel Tower. It is now the HQ of Radio France. In 2003 the central tower was declared unsafe because there was insufficient protection against fire, and there was talk of Radio France moving elsewhere. In the end, it was decided to improve the whole building complex. There was a major fire on two floors on 31 October 2014. As it is winter in the Northern hemisphere, it seems appropriate to visit Chamonix, the famous skiing and mountaineering resort in the French Alps. 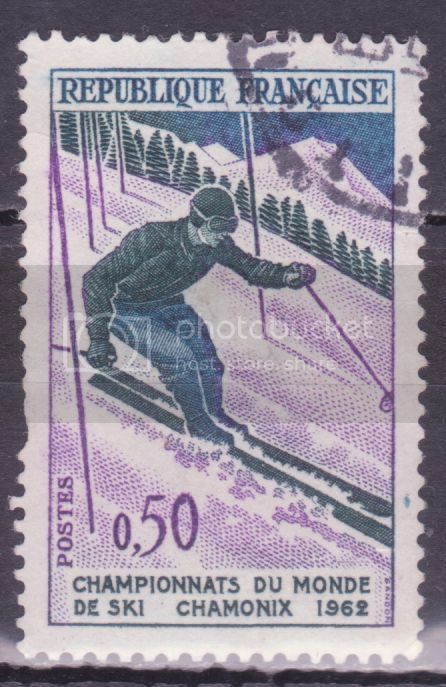 Here is one of two 1962 French stamps commemorating the World Skiing Championship held at Chamonix that year, SG 1559. After the Alps in winter, I want to warm up. Here is a 1963 stamp (SG 1620) showing part of the coastline of Var in the Côte d'Azur (often called the French Riviera). The Côte d'Azur was one of the first Mediterranean summer resorts, popular among the better-off British and others from the mid-19th century, when railway connections made getting there easy. One of the main cities on the Côte d'Azur is Nice. This 1946 stamp, SG 974, shows the arms of Nice, with a red eagle on three mountains surrounded by sea. Nice became a permanent part of France only in 1860. Here is a picture of the French coast at Nice - 1955 SG 1264. Still on the Mediterranean coast of France, Marseilles is the second largest city of the country. The region round the city has been inhabited for thousands of years - there are cave paintings from between 27,000 and 19,000 BC. the ancient Greeks colonised it in about 600 BC and it was one of the most important ports in the Graeco-Roman world. Many of the populace were ardent supporters of the French Revolution and the famous Marseillaise was a song sung by some 500 volunteers on their way to support the revolutionary government in Paris in 1792. In the 19th century it became a major industrial city. Here is a 1955 stamp, SG 1263, with a view of the city. On the Bay of Biscay, near the border between France and Spain, is the Basque city of Biarritz. A fishing and whaling base in medieval times, in the latter 18th century, when sea-bathing was regarded as medically beneficial, it became a seaside spa. In 1854 Empress Eugénie, wife of Napoleon III, had a mansion constructed on the beach, and members of a number of 19th and early 20th century royal families stayed in the city. In 1908 the British king Edward VII departed from protocol when he summoned the incoming prime minister Asquith to kiss his hand at Biarritz instead of returning to London for the ceremony. Immediately after World War 2 the US established a University campus there for demobbed servicemen, who spent a term studying in Biarritz to help them make the transition from military life to civilian life and university back in the USA itself. 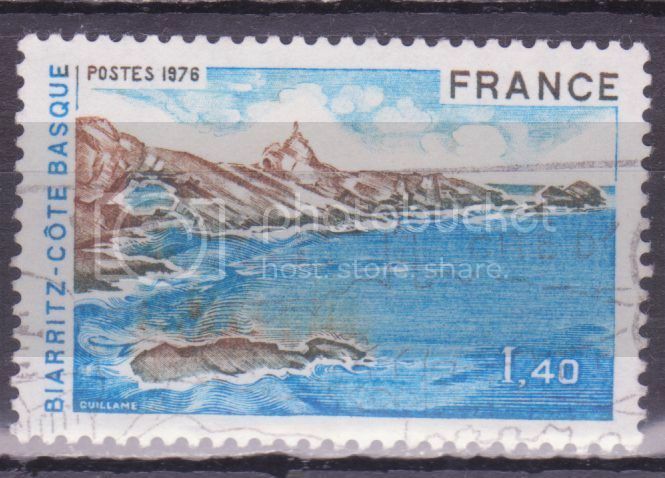 Here is a view of the coast near Biarritz on a 1976 stamp, SG 2117. Some way North of Biarritz is the seaside resort of Arcachon, which as a town dates back to only 1857: before that it was woodland with huts where fishermen and country people dwelt, some of them just in the summer. Nearby is Europe's biggest sand dune, over 2.5 km long and 100 metres high, and some 500 metres wide. The dune is gradually moving inland. 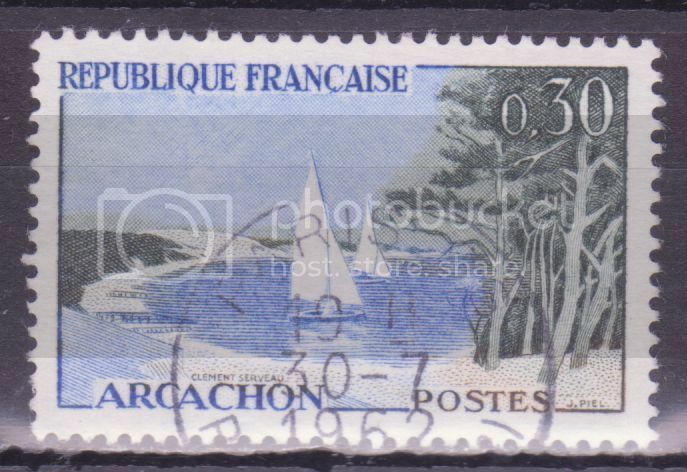 Arcachon features on a 1961 French stamp, SG 1543. Travelling North again, and a little inland, we come to the town of Cognac on the river Charente. On one of the pilgrim routes to Santiago da Compostella, it contains an old quarter with medieval buildings. Jean Monnet, who helped found the European Union, was born there. It is of course best known for the variety of brandy named after it; also made in the region is a delicious aperitif, pineau des charentes. 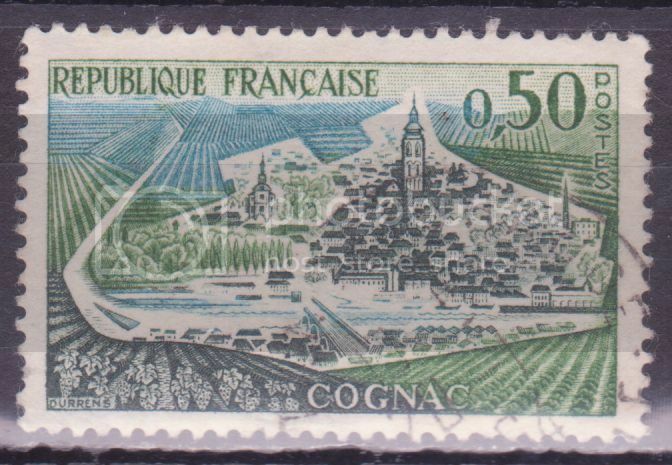 This 1961 stamp, SG 1546, depicts the town. These remind me that, aside from winning a few mint sets and singles on eBay and mounting them,I haven't looked at my France in ages. I have been away, and then spending a lot of time transferring things from a PC to a Macbook. The driver is about to take his seat in his cab. Fasten your seatbelt. The coach is moving again. To Brittany, and one of the greatest neolithic sites of the world - Carnac, with over 10,000 standing stones in a series of straight lines, and a number of dolmens (stone grave chambers). 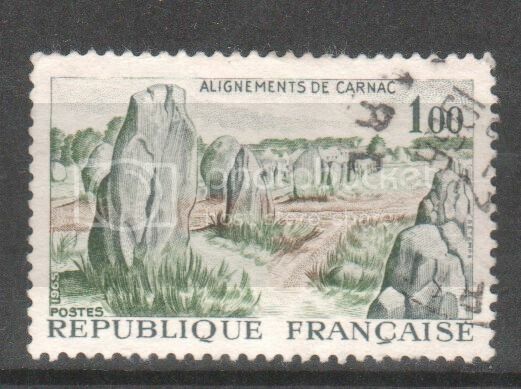 Here is part of Carnac on a French stamp of 1965, SG 1688.